The beta test for Bungie's upcoming first-person shooter, Destiny, will commence in late July for both of Microsoft's home consoles. If you have the game pre-ordered, you'll be able to partake in the semi-closed beta on the Xbox 360 or the Xbox One. Videogamer managed to spot a quick glimpse of when the beta would commence for the Xbox 360 and Xbox One via a video that was playing on the Xbox storefront. The image clearly shows that the beta is coming in late July for the Xbox One and Xbox 360. Check it out below, courtesy of Videogamer. IGN further noted that an Xbox Live Gold account would be required to partake in the beta. This means that you not only have to have the game pre-ordered but you'll also need a subscription to Microsoft's online multiplayer service. The above requirement shouldn't come as too much of a surprise, given that similar rules applied for the Destiny for the PS4's alpha test. Of course, the alpha test allowed a lot of players to get in and play the game without having to pre-order the game. The beta test is a bit more stringent in that regards, but it also makes a ton of sense for anyone who does pre-order. I'm definitely not for pre-ordering a game so well in advance of its release, but if you do decide that you want to throw your money at the publisher for an unfinished product it's nice to know that the company has reserved a window in which a playable version of the game is made available to those who did lay down some money for the game. If you paid early for Destiny, you at least get to play it early. Realistically, every major AAA game with a lucrative and marketable pre-order campaign should probably do the same thing. 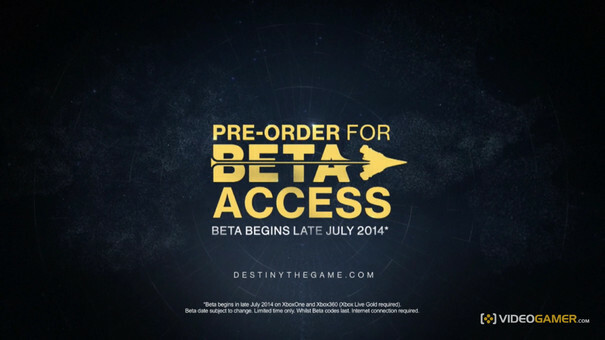 Even though Xbox gamers will gain access to the Destiny beta in late July, they won't gain access to the DLC until late 2015. Some gamers have noted that it seems terrible having to wait so long after playing the alpha to get their hands on the full version, mainly since the alpha took place earlier in this month and the game is still a few months out. Highly anticipated games can definitely wear on the nerves when it comes to building up unbridled anticipation. For those of you who can't contain yourselves, you won't have to wait long after the beta to get your hands on the full version of the game, as there's only a one month span between the beta test and the launch of the game. Destiny is due for release on September 9th for the Xbox 360, Xbox One, PS3 and the PS4.